StackAnalyzer for H8 now available. New QSK available for the aiT module of a³ for LEON3 (gcc-3.4.4). New QSK available for the StackAnalyzer module of H8 (including measurements). Extended WCET QSK for MPC603e: added tests for local loop-bound specifications via source-file references. Extended Stack QSK for M68020 by measurements. The QSK test procedures are now supported by a graphical user interface. Extended QSKs by new tests for recently added AIS features. Extended QSKs by new tests for recently added a³ GUI options. All QSKs are now shipped with an additional report called “Software Verification Results”. This report is an acknowledgement that all tests have been successfully executed before the delivery. zlib compression tuned for speed. Improved speed of prediction-file base toolchain. Fixed the issue with the very first XTC request not being answered under certain circumstances. Folding all nodes will no longer cause the graph to be hidden. Nodes found via the search dialog can now be made visible by double-clicking on the search result. The number of graph folding operations has been reduced to a minimum. Empty tooltips are no longer displayed. Improved reading of large DWARF debug info inside the GUI. DWARF debug info and Sections info only created and loaded on demand. Better cleanup of temporary files. Better message handling for background threads such as disassembly writer. Fixed disassembly problem that resulted in some routines not being shown in the GUI. 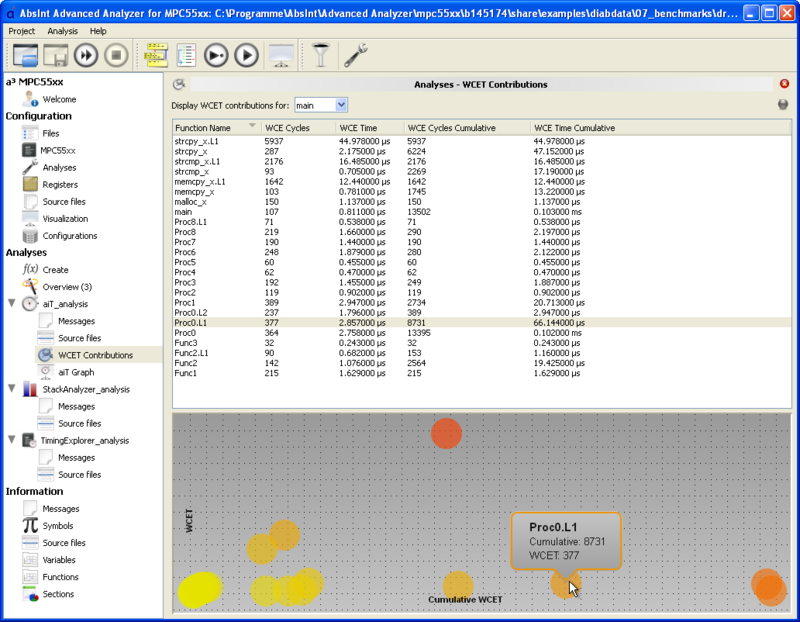 Added graphical visualization of the WCET contributions (see screenshot). Show which analysis are to be run in the summary view. Show error if specified machine description file does not exist. Each information view uses the same filter dialog. Highlighted errors in editor view are cleared upon re-running an analysis. Improved search in the Graph view (see screenshot). Added overwrite mode in the text editor. Improved analysis overview: analyses can now be re-sorted via drag-and-drop. All editor, message, and disassembly views can now be detached from the a³ GUI (see screenshot). In the debug views, type information is now displayed in cases for which it was missing before. Improved Disassembly view (see screenshot). Fixed problem with Windows filenames and “Display source”. In the WCET Contributions view, missing or unavailable analysis results are now marked as “n/a” rather than as “-1”. The message window is no longer cleared upon analysis start unless expressly configured that way. Improved the “Show applied annotation” feature. If the same AIS annotation is valid for several subsequent source-code lines, their buttons for jumping to the annotation are combined into a single one (see screenshot). Code view has been renamed into Disassembly view for improved consistency. “Disable visualization” applies to batch mode only. H8: “CPU Variant” has been renamed into “Instruction Set”. HCS12: clarified that register contents (not register addresses) have to be specified in the machine configuration dialog. New annotation “skip target check” replaces the annotation “computed_target_feasible=1”. Targets of indirect function calls can now be specified. AIS expressions can now produce and process modulo information. New operators “uint” and “sint” for casting arbitrary values to unsigned and signed integers of given bit width. New operator “exactly ==” for comparing two sets of possible values. New operator “exact” to test if a value is exact. Special value NaN is replaced by (-inf .. inf). The predicate “defined” that tested for NaN has been removed. The “round” operation is now called “int”. HC11/HCS12: annotations describing the effect of the swi instruction on stack and timing have been replaced by more generic ones. V850: new annotations for software exceptions. ARM7: flashes (with description in AIS) are supported again. a³ with contexts: there can be more than one interproc specification. a³ with timing and daan: execution times of code snippets excluded from analysis may be expressions. a³ with timing: loops may have time bounds. New short form “position .. + n bytes”. New form “position align + n bytes”. New annotation “might contain data” for memory areas. a³ where memory accesses are of importance: clarification about “ARRAY + 0 bytes”. Reduced memory usage during DWARF debug info extraction. GHS compiler: improved handling of data symbols containing path names. The symbols are now transformed in the same manner as routine symbols. The decoder now warns about relocations (non-statically linked binaries or presence of dynamic link info). Improved detection of read-only memory areas and the “is copied from” annotation. Improved handling of the program-point annotation “<name> + <n> branch/conditional”. Fixed issue with include paths for finding source files, if the path separators don’t match the ones of the used operating system or are mixed (/ vs. \). C16x: fixed mnemonic for addresses in bit-addressable modes. Improved decoding of jsr/jmp @@a8 with zeropage address indirection. Improved mnemonics of several instructions. Improved decoding of CPS instruction. Improved readability by using alias mnemonics for assembly instructions. Support for xb-byte encodings for call instruction with computed call target. M32: improved decoding of several instructions and their representation in the disassembly. M68020: improved decoding of switch tables (XD Ada). Support for DWARF line info. Correct order of operands for exit instruction in decoded assembly string. Improved decoding of load/store instructions. Improved decoding of control-flow instructions. Consistent assembly strings for immediate constants. Extension for switch table detection. Improved decoding of switch tables for GCC. The annotations “condition ... is false if ...” and “condition ... is false make infeasible” now work for conditional branches with delay slots. This improves the analysis precision. 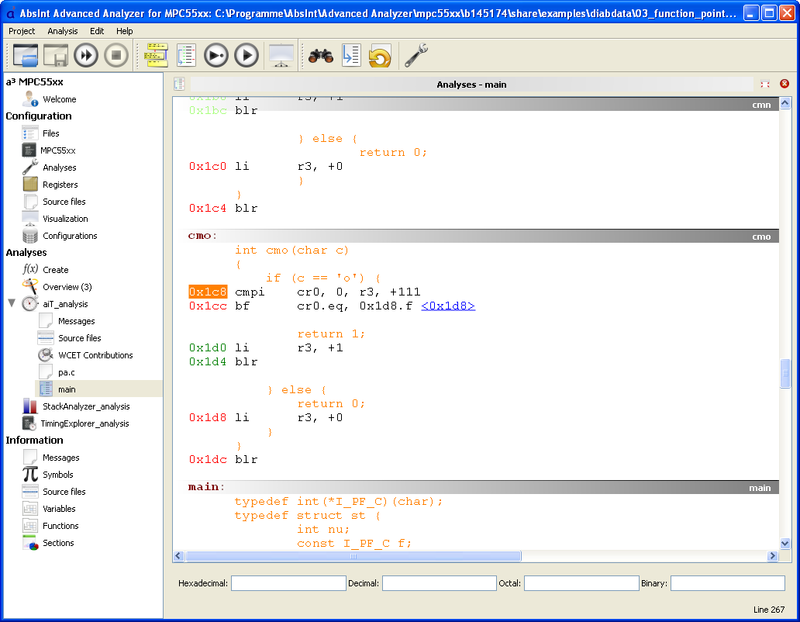 Improved decoding of switch tables (GNAT Ada compiler). Improved handling of tail calls. General improvements to decoding of V850 binaries. Improved decoding of binaries comprising code holes. Better decoding of computed branches and tail calls. Handle “fetrap”, “syscall”, and “rie” as trap. Improved resolving of indirect function pointers. Improved detection of size information for stack frames embedded in the code segment for StackAnalyzer for V850/GHS. Value analysis is less strict with asserts annotations evaluated in speculative analysis contexts. Improved precision for instructions such as sub.w. HCS12: the value analysis now aborts when no memory map is specified. This check was previously done by the pipeline analysis. Stack analysis now available for generic V850 E1/ES and E2 targets. Improved handling of computed calls in stack analysis. M68020: stack analysis now supports the STOP instruction. PowerPC: improved precision of value analysis thanks to ranges for loop variables calculated by loop analysis. New, improved implementation of the prediction-file based path analysis. The analysis is now faster, consumes less memory, and uses no swap files. New, improved implementation of the prediction-file based path analysis using ILP which allows additional user constraints and persistence analysis. Correct handling of address ranges above 0x8000000 in the count-accesses annotations. Prediction-file based path analyses now support the TLB miss penalties. Improve persistence analysis for not fully unrolled examples. Improved persistence analysis if multiple caches are used. Local best case added to multiple targets. The unrolling-consistency check for user-provided loop bounds is now also performed for default loop bounds, possibly resulting in more warnings such as “loop seems to have more iterations than specified”. The report file now includes the bus configuration. PPC750: improved handling of write-triggered reads on write-back memory areas. TriCore: improved handling of writes into external memory. More user-friendly handling of memory accesses that target unknown memory regions (i.e. memory regions that are not specified in the AIS file). Improved timing model with regard to prepare and dispose instructions. Minor fix for memory map generation for V850E/FK3-H: the area 0x3fec664…0x3fec665 now correctly contains CAN1 module transmit history list register instead of being classified as a general programmable peripheral area. 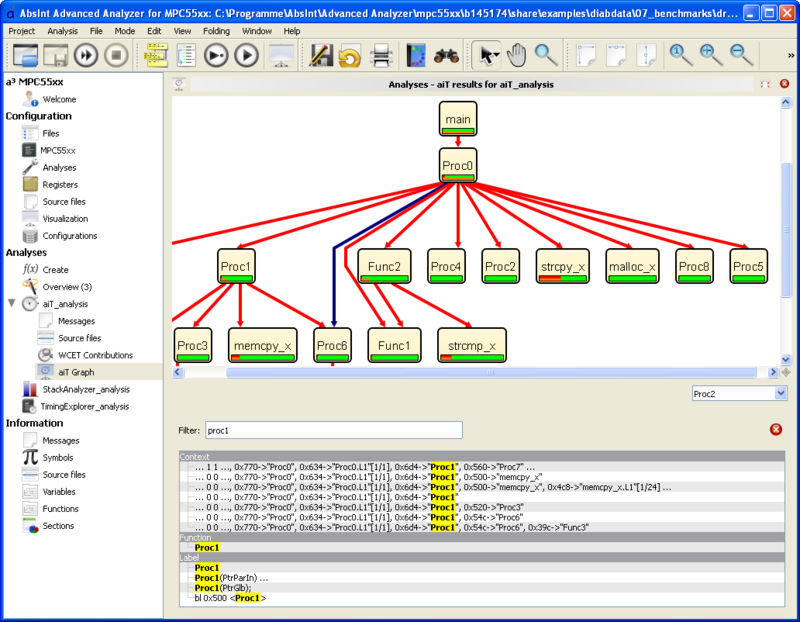 Significantly improved performance and reduced memory consumption of the pipeline analysis. Output UCB results per “evaluated as” annotation. Added optional validation by means of NEXUS-like measurements. The user may now specify an address range for bus and queue event traces, limiting the scope of validation to events contained in that specific address range.